I have suffered from depression on and off for years…usually during particularly difficult phases with Katherine and her ever changing needs. Parenting any child can be difficult. Lots of parents say that it’s not different than any other parenting and for some, maybe it isn’t. But for a whole lot of parents with special needs children, it is totally different and I couldn’t disagree more. It’s hard as hell and there’s been far too many days where I couldn’t see how I could take the behaviors or another 18 hour day of therapies, eruptions and feeding tubes. If this sounds like a day you might have experienced in your life as a caregiver, I want you to know there is help available. Depression in special needs parents and caregivers is all too real and all too often brushed off or ignored. I read an article a number of years ago that discussed a study. It found that some moms of autistic children may be prone to depression. I have to tell you that really aggravated me. Not because the statement isn’t certainly true, but parents of autistic children certainly don’t have a corner on the depression market. Anyone who is the parent of a special needs child realizes that any parent of a special needs child, mother or father, may be prone to depression. When a parent comes to the realization that their child may be different there is almost always a sense of guilt and/or loss that can become a more serious depression. Moreover, the type of disability the child has makes a difference as to the level of depression and accompanying social anxiety. One study specifically goes into the level of social anxiety in parents of children with mental illness. That’s another one I can speak to. Over the years I have become far more introverted than I ever was earlier in my life. I have a very tight knit core group of friends. When people are reaching out to me and I can frequently feel the anxiety rise. The harsh reality is that many of those people would likely be lovely, kinds souls. It’s never who is imagined in my minds eye however. I have this gremlin who tells me how horrified they will be at Katherine’s behavior, how they will knowingly tell me that Katherine’s disabilities are my fault and my doing and make me the social pariah of the eastern seaboard. Unrealistic? Completely! My gremlin is pretty good at talking to me and convincing me he knows all – some kind of omniscient green thing with bumps. Think Sesame Street on a bad acid trip (please people, the acid piece is just expressive not actual) I’m guessing some of you have a “friend” like this who tells you similar things. Actually we all have a gremlin or two. The question is how to quiet the dang thing so he’s just aggravating background noise. As a great therapist once told me, the voice only has as much power as you give it. I have the choice to listen to it and give it’s word credence. He also told me that the more I can distract this gremlin the better off I’d do. I do know this – the more I allow that gremlin to enter my thought process, the more anxious and depressed I become. Sometimes this only happens once every few months, some times it happens several times in a week. Kind of depends on a number of influences not the least of which is Katherine. This is especially true in a week where Katherine is having an especially rough time or I am battling windmills trying to get appropriate services in place. The reality is I spend an overwhelming amount of my time focused in on how Katherine feels. How Katherine is doing. Getting Katherine what she needs, and so on that I really have to remember to dial in to how I feel. As it has been explained to me numerous times by that great therapist I don’t do anyone, especially Katherine, any good if I get myself stuck in the gremlin goo. (it’s supposed to be a visual, let your imagination run wild) This got me thinking about how I deal with this depression and how other parents can too. Is it Depression? Everything is awful! For a long time I didn’t even acknowledge it was depression. 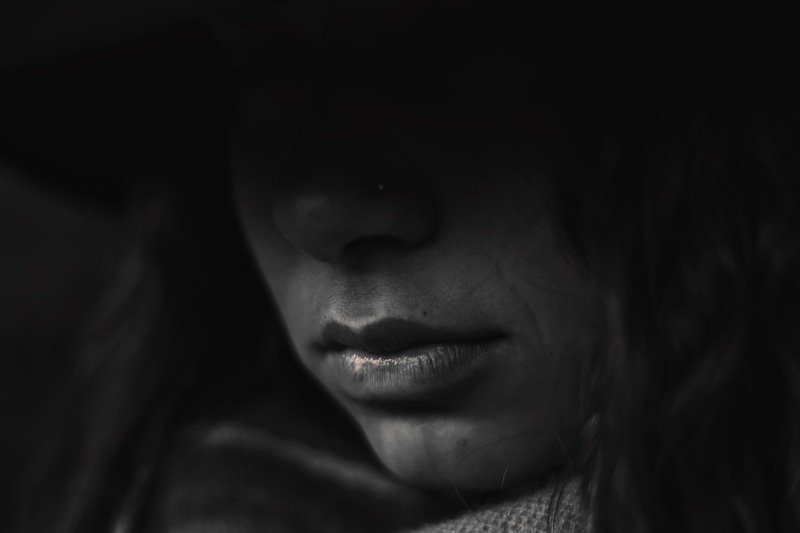 I wasn’t depressed – I was having a rough day (ok, so what if they strung together for days, weeks or months at a time) For a time, I needed medication and therapy. I tell you this because maybe knowing there’s another mom out there who needed help might make you feel less alone. By the time I came off the meds, my therapist and I had developed a varied list of things I could do to fight off the blues which we all inevitably feel from time to time to keep it from gaining control. Sometimes I have less than 5 minutes sometimes I have a couple of hours after the kids are in bed. 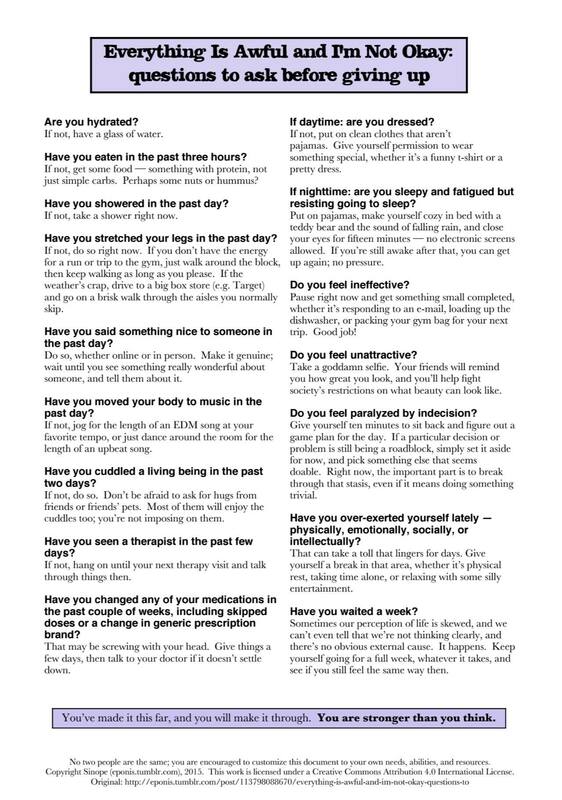 Here’s my list of 10 things to combat the onset of depression for a starter. Start a project – make sure the project can be broken into multiple pieces – your the mom of a special needs child – you’re not likely to have an 8 hour stretch you can devote to a project – scrapbooking, redecorating a room, reorganizing some files, start a garden – I started this blog. Take a big pillow and scream as loud as you can into it – sounds ridiculous and you may feel like an idiot the first couple of times but the primal release it gives – well there’s nothing quite like it. Eat well – sometimes I realize my mood is because all I’ve had all day is a cup of coffee – I don’t mean binge – I mean make sure you’ve fed yourself a healthy meal to give you the energy your body needs. Cry – oh I know, that sounds ridiculous – but honestly it releases that pent up sadness in a natural way – you honestly can feel better just having a good cry. Help Someone Else – volunteer to help the elderly, work on a community service project, donate time to a food bank. Yes, your life is hard – there are different kinds hard. Helping someone else can give you a real boost. Taking care of our kids is hard work. Taking care of yourself is critical to your child’s well being and overall success. Talk to a spouse, trusted friend or clergy member if you are experiencing the problems above. They can help you find your way to the proper help. It’s NOT weakness. You did NOTHING wrong. You CAN overcome it with the proper help. Let’s help one anther by using the comments section to add what you use to fight off the blues as well!